This is the final installment of kid-friendly Indian dishes. Obviously this dish was inspired by my insistence that people, and in particular kids, like to eat things off of sticks. I also wanted to experiment with BBQing seitan, operating on the rationale that baked seitan tastes pretty darn good so how much different would it be to BBQ it? So, can you BBQ seitan? The answer is yes, but with two caveats. First, you really have to keep the heat low. Seitan is not meat and thus does not ooze fat and blood and whatever else comes out of flesh when you cook it. Therefore, if you go firing up the BBQ like you are grilling a steak, then you, my friend, are going to end up with a dry, crunchy, and altogether unpleasant meal. Second, you need to regularly turn and baste the seitan to keep it hydrated. The end result was a very meat-like skewer. Maybe too meat like. They were a little chewy, but the kids absolutely loved them--especially because they could poke each other with the skewers when the meal was over. 1. Put your skewers in a pan of water and set aside. 2. In a medium bowl, mix flour, salt, and spice mixture together. In a separate small bowl, whisk together soy sauce, oil, and water. 3. Add wet to dry and mix well. This will result in a pretty tough and rubbery seitan. If everything isn't perfectly mixed and the seitan looks marbled, don't sweat it it will still taste good. 4. Mix together yogurt, oil, and spice mix in a bowl. Cut seitan into 24 chunks and add to bowl. Coat well to keep the seitan chunks from bonding with one another in the bowl. Let marinate for 30 mins in the fridge (less if you are in a hurry). 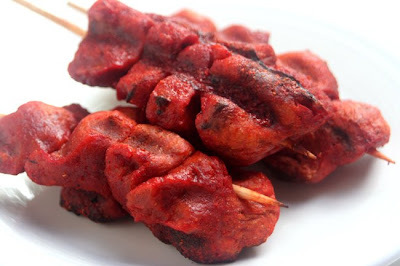 Remove seitan from bowl and put four pieces on each skewer. Add 1/2 cup of water to the marinade left behind and mix well. 5. Heat grill on low. You want the temp to be about 400 to 450 degrees. Oil the grill well and place skewers on grill. Close lid and cook for 3-4 mins. Flip skewers over, lightly baste, and cook for another 3-4 mins. Keep going like this until you run out of marinade. The seitan should cook for about 20 to 25 mins, and you may not need to baste each time you turn. Just make sure it looks hydrated.